Beaker & Flask has closed permanently. Years ago, I was sitting at the Park Kitchen bar talking to their bartender Kevin Ludwig, while I was having dinner. He mentioned he was leaving PK, and opening his own place somewhere on the East side. As I recall, he planned on having the bar as the main focus, with a variety of small plates to compliment the drinks. As is frequently the case, the plans changed, and the final incarnation is different than the original intent. First came a very long delay with the build-out, then the unexpected influx of some kitchen equipment that Vitaly Paley no longer needed, and finally a deal with Paley’s alumnus Ben Bettinger to run the kitchen. First off, full disclosure: Kevin Ludwig is a casual friend. I’ve never talked to him except from across the bar, but he figured out who I was when I first started my website. For this reason, I approached this review a bit differently than others. Over the past year, I’ve been working with some friends, going out, eating lots of different things, discussing the food, and generally preparing for the day when they could do a good portion of the eating for me when I’m unable to. They’ve given me lots of input on the past four or five reviews and their notes contributed to a large portion of this one. I trust their palates as much as I do my own. When I went to my review dinners at B&F, they went too, but sat at a different tables. We compared notes later, which, together, are the basis for this review. I have full confidence that this is an accurate representation of what you can expect from Beaker & Flask. The space is quite nice. 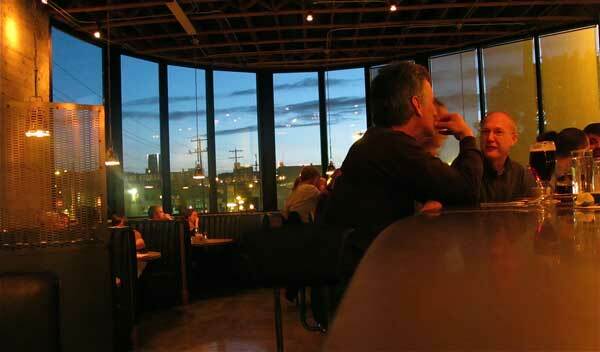 A beautiful curved wall of windows takes up the west side of the restaurant. The dark-colored booths are comfortable and big enough for groups. Mint green has been used both on the walls and on the tile under the bar, for a relaxing effect. Slick polished concrete floors and an unfinished ceiling pay homage to the building’s industrial past. Some changes have been made since the restaurant first opened. Originally, old barrels were used for tables in the middle of the room, which made for awkward seating. They have now been replaced with regular high tables and chairs, which are much more comfortable. The sun used to blaze through the large windows during the afternoons, but shades have now been added to mitigate the glare. There were also some service problems. Because the drinks take time to craft, it sometimes took too long for them to arrive, and the floor service was not up to par. However, my experiences over the past few months have been flawless, with the exception of one night where I was forgotten at the bar. I can’t possibly review Beaker & Flask without spending some time on the libations. Kevin takes the art of blending drinks seriously, and whether you are looking for a traditional cocktail or a more modern drink, you can be sure whatever they put together will be made correctly. Cocktails are served in vintage glassware, a nice touch. One evening, I watched as a happy couple came into the bar. They took one look at the menu, wrinkled their noses and got up to leave. I overheard the woman say, “These drinks are nothing like most places – they sound disgusting!” It’s too bad they didn’t stay and try a few; it would have probably opened their eyes to something besides sweet martini drinks. The combinations of ingredients may seem a bit off-putting at first, but take a leap of faith, find a base liquor you like, and try one of the current cocktail specials. Great care is taken not only in the quality of the liquor, but many of the ingredients are homemade, and even the ice cubes are matched to the type of drink being served. Though some may think this is a gimmick, there is sound science behind the different sizes and shapes. It boils down into how the ice interacts with the drink itself. In some cases you want the ice to melt slowly, in others you may want smaller or even finer ice so it dilutes to bring the drink into balance, or cools more quickly. 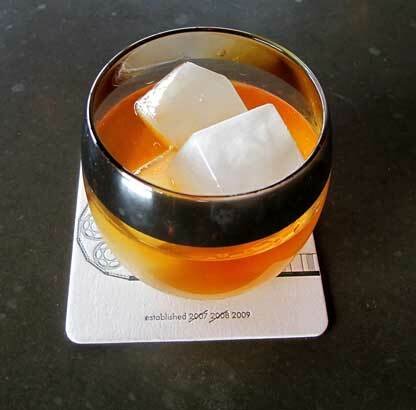 Melting ice adds water to the drink, which changes the overall flavor profile and allows some liquors to “open up”. I can honestly say I’ve never had a bad drink at Beaker & Flask. Sure, there are some I like better than others, but this is a personal preference for certain flavors or alcohols. There is also some inconsistency between bartenders, but they are mostly subtle. Some of my favorites cocktails from recent menus include “Stuck in Lodi” with rye whiskey, Gewürztraminer syrup, Cynar and Peychaud’s bitters, the “Norwegian Negroni” made from Krogstad Aquavit, Cynar and sweet vermouth, “Sal’s Minion” of aged rum, pineapple gomme and coconut water ice cubes, and the “New Vieux”: rye, apricot, Benedictine and bitters. All of them are $8, which is a bargain these days. During happy hour which runs until 6pm, a selection of special drinks is available for $5.00. Attention has also been paid to beer and wine, a rarity in most serious cocktail lounges. Five beers are available on draft for $5, 12 by the bottle from $3 to $7. Selections are somewhat out of the norm, covering the gamut from Oskar Blues “Dale’s Pale”, to the Czech Republic Primator Maibock, Pinkus Munster Alt Munster, and Saison Du Pont, Brasserie Dupont from Belgium. You’ll also find 18 wines by the glass, ranging from $7 to $10. Kevin’s palate is similar to mine, and I have found all of the selections acceptable, especially at the price point. Under Chef Ben Bettinger’s creative eye, the food menu has expanded beyond the original intent. Not only is Beaker & Flask a destination for some of the best cocktails in town, but it also serves some of the best food in Portland. If you have followed this site for any length of time, you know that, in general, my mantra is less is more – keep things simple and let quality ingredients speak for themselves. Unfortunately, many chefs don’t adhere to this principle, and tend to overload dishes with an abundance of ingredients to show off their mad skills. Ben seems very comfortable in the kitchen and doesn’t play this game. Instead, he selects ingredients based on the best available, and fashions dishes that showcase the different flavor combinations. The menu is divided between small and large plates, but many from both sides of the menu are quite large, and can easily be split between two diners, giving you the opportunity to try a larger variety of selections. The butter lettuce salad has been a menu staple since the first week. It’s simple and refreshing; a large mound of vibrant greens complimented with a buttermilk and tarragon vinaigrette which makes for a refreshing start to a meal. It’s heavily dressed, but isn’t oily, and the lettuce doesn’t get soggy, so it works. My only complaint is that sometimes the tarragon is a bit heavy and tends to clash instead of complement the other ingredients, especially when the greens are really good. However, that doesn’t stop me from ordering it on most visits ($7). Though our cool summer hasn’t resulted in corn comparable in flavor to normal years, Ben succeeds in bringing the quality of what is available to a higher level than expected. It’s cooked quickly and served on the cob, each kernel sending little volcanic bursts of flavor, added to by the addition of poblano aioli and Grana Padano cheese ($6). Chef Bettinger shows a deft hand with sweetbreads, turning out some of the best in town. I’ve had them many times over the past year, and each time the composition has been perfect. Early this summer they were pan-seared and served with a medley of spring vegetables and bacon chowder. The glands are clean, creamy and loaded with flavor. More recently, they were paired with Dungeness crab, late summer corn and shell bean succotash. Don’t miss them ($11). Soft shell crab frequently makes an appearance. I tried them a few months ago, paired with golden beets, English peas, potatoes and sea urchin vinaigrette. The dish spoke of late summer, crispy, slightly earthy and comforting. It only suffered because I’d had an astonishing blue crab salad at Paley’s the week before. Last week I returned to B&F and tried the newest version. The crab was paired with a finely puréed bright tomato “gazpacho” with fresh and crisp thinly sliced cucumbers, and brilliant little cherry tomatoes that tasted as if they may have been lightly roasted to bring up the flavor. The overall combination was just right. If you haven’t had soft-shell crab before, it is to be eaten whole, legs and all ($11). 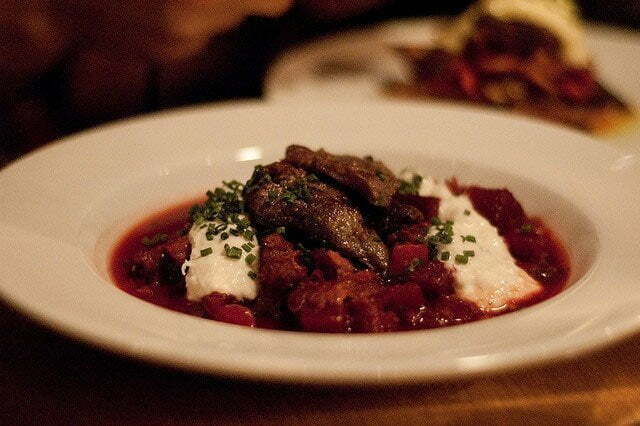 I’ve eaten so many pork cheeks at Beaker & Flask that pigs for miles around must have lost their dimples. As of this writing, they are served on crisp bread with bright braised peppers and onions, amazing tender pickled octopus, earthy cheeks and a creamy yellow aioli. 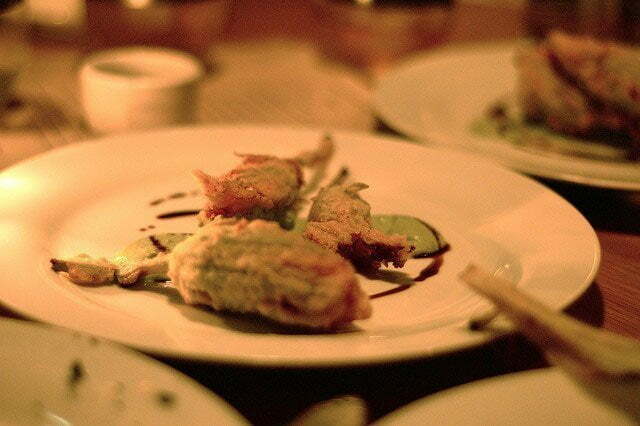 A dusting of green herbs gives a splash of color, and a slight spiciness provides a pleasant finish. While the combination of beef cheeks and octopus may seem a bit strange, the first few bites will win you over. ($11). Grilled rabbit makes a regular appearance, and is terrific. I love the current version which features roasted turnips, carrots, sugar snap peas, earthy morel mushrooms and a simple sherry cream. Many times with dishes like this, the different vegetables are cooked unevenly, but I’ve had the rabbit three times, and all the components have been crisp and fresh and properly cooked. The meat is slightly gamey, as it should be, with a mustard glaze adding additional earthy flavor and depth. A bit of herbs sprinkled over the top finishes the dish. Another version which was similar and just as good, featured crispy lardons and braised artichokes with sautéed morels. Occasionally small sections of the rabbit were a bit dry, but I had to work to notice ($19). The Tails and Trotters pork is truly a large plate. There is a fair portion of crispy fat in the meat, but in a good way. The pork has a nice grilled flavor and the accompanying cabbage slaw matches well, with the tangy vinegar taste playing well off of the fat, cutting the oily texture that could otherwise be imparted to this dish. Grilled onions and a pomegranate glaze add a subtle sweetness to balance all the ingredients. It’s excellent comfort food, and I hope they keep a version around through the winter months ($19). Over the summer, Bettinger ran a pan-seared halibut, which arrived laying alluringly in a purée that burst with carrot flavor. The fish was sprinkled with bright green English peas, and topped with a lovely little mound of bay shrimp. Crème Fraîche finished the dish, providing a creamy backdrop for the carrot flavor. The fish was moist and crisp, all the colors and flavors contrasting beautifully without overpowering each other ($20). Grilled beef shoulder is offered with smashed new potatoes, grilled onion and the Catalonian sauce, Romesco. The meat is moist and tender, and though my personal preference for Romesco leans towards something with slightly more punch, this is still a successful dish, especially comforting as the short days of fall approach. The meat has a nice grilled flavor, which plays a nice counterpoint the the complex sauce ($21). 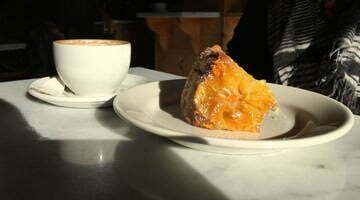 To me, the biggest weakness at Beaker & Flask are the desserts. They satisfy, but are rarely memorable. 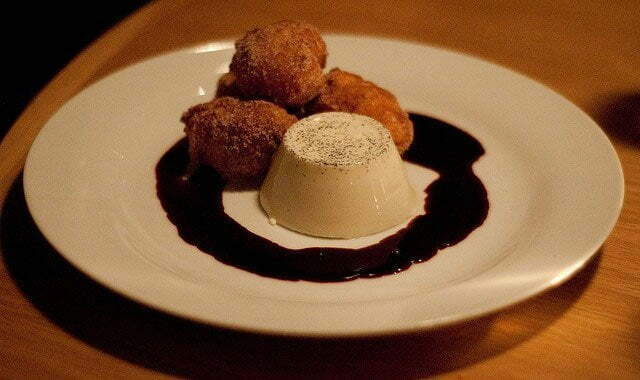 The beignets are fine, light and sugary, but not too sweet. They are excellent on their own, but are served with a lemon panna cotta, which could use a little toning down, as the flavor is strong enough to mask the other ingredients ($7). The warm chocolate brownie with caramelized banana tends to get lots of attention because it is served with foie gras mousse. I tried the dessert twice, but it just doesn’t impress me. The brownie has been dry, the mousse unmemorable ($7). For a simpler way to end your meal, try the Xocolati de David chocolate plate, paired with chilled Krogstad Aquavit. David is a genius when it comes to pairing chocolates with savory flavors. Expect the unexpected and pay attention to how they match with the Aquavit ($10). Beaker & Flask is a surprise, currently the only bar in Portland where the quality of the food matches the thoughtful detail put into the cocktails. Though it is sometimes crowded on weekends, it’s easy to slip in during the week for an excellent meal. Once Kevin opens his planned “more intimate” bar in the upper half of the building, there will be additional food offerings. He expects to be open until 2 a.m. to cater to the industry crowd, and is kicking around some new ideas for food. At the moment they are thinking about doing something along the lines of a limited menu classic American continental cuisine from a bar perspective, but with a fun and somewhat retro-quirky spin. In the meantime, if you haven’t given the restaurant a try, you should. It’s a great place to while away a fall evening, and increase your knowledge of both food and cocktails. Thank you to Tim Roth and Beaker & Flask for the photos. Spot on review! I’ve been to Beaker & Flask twice now and find myself dreaming of returning and plotting when it will fit into my schedule. I’ve never been a cocktail person, but their concoctions are amazing, leaving me wanting to drink my way through the full menu – accompanied by the best deviled eggs I’ve ever had. I’ve had the softshell crab and the pork cheeks as well as a few of the other plates, and my dining companion always has the sweetbreads. We are delighted every time. Loved the beignets. I would have preferred to have the carmelized banana and foie gras mousse on their own, the brownie was just too sweet. I had no idea pork cheeks came from cows…. Well that shows what you know! Cows are very friendly with pigs. As a matter of fact, they frequently have adventures together. They get very upset at seeing their piggy friends being taken away. That’s why the cows stop smiling. Good review, and pretty spot on from my point of view, and here are my thoughts on the subject. I do not consider b&f to a ‘cocktail lounge’, in my opinion it is a restaurant with great cocktails, it ceases to be a cocktail lounge when you do not keep any seats open for walkins. In the past I have stopped in for a quick drink only to be told that the entire bar was for reservations and that we would have to put our name on the list and wait. Also, the cocktail menu doesn’t change enough, there was a 3-4 month stretch when I don’t think a single item changed on the cocktail menu, but the seasons and weather had. Lastly, the inconsistency between the bartenders really bugs me sometimes,I have been forgotten at the bar as well, never receiving my food. I now make a point to go on certain nights for that reason. Lastly, I have found that for the most part no matter where you are, NY, LA, SF, PDX it takes longer for your drinks to arrive at these types of places, cocktails of this caliber take time, like most good things. Be patient, it’s usually worth it. The wait was overly long when they first opened, but seems perfectly reasonable to me now. I agree though, the short wait is worth it. This is not a place to go and get your drink on. I think the food here is some of the most underrated in town. Our last meal was outstanding (and I am not given to gushing): the pork cheeks dish alone was worth the visit. But I wanted to comment on the drinks. I have some sympathy for the couple who walked out in disgust. While I think that is a shame, the cocktail menu is a little, shall we say, alienating? For me drinks are about comfort and friends, not wild experimentation. I realize I may be forgoing a mind altering experience, in more ways than one, but what I usually want when going into a bar is my favorite libations (obviously this differs for every person but you hopefully get the point). So I would advise anyone in a similar frame of mind, don’t walk out. Instead order one of your favorite classic cocktails. On this particular evening I ordered an Old Fashioned. When asked what sort of whiskey I was happy to let the bartender choose. Instead of whiskey I got an unctuous, amber-colored sipping rum. It was fantastic and rounded out what had to be one of the best Old Fashioned cocktails I’ve ever had. So, for the conservative drinker, don’t forget the classics. They can make them at B&K as well as any place you’re likely to try in this, or any other, town. people(macro)are stupid. I know so many people that either can’t wrap their mind around experimental food or beer or spirits or…. One of my favorite places to eat. Great food and great prices. Not mentioned (I think, I sort of skimmed though) though not to be missed are the homemade pretzels hot from the oven with spicy mustard and a beer back. I could eat platefuls of those things. Just want to pipe in here to say that B&F’s happy hour runs every night, from 5-6. This can be a bit confusing, as their website, which is basically non-existant, re-directs to their blog, and the only mention of a happy hour on there is in a post from about a year back which mentions that the happy hour was discontinued. It’s back, 5-6. That is all. Just returned to B&F after a few months of not making it there and had an EXCEPTIONAL meal. Perfect French 75s from the bar, followed by the last bottle of the 2008 Cameron Pinot Noir. The grilled corn and the pork cheeks were perfect as were the Trails and Trotter’s Pork Belly and the Rabbit Roulade. And the brownie with foie gras mousse was memorable. We’ll go back again, soon. What a great review. It does come off a bit bias but B&F deserves all the credit it can muster. Benny B is the attraction and the cocktails are spot on as well. 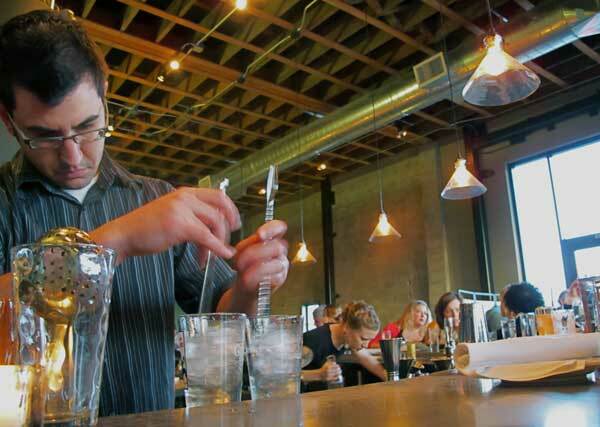 David Shenaut is making a name as one of the best, if not the best bartender in Portland. Go check him out. We went there while in town for business this week. At the bar waiting for two other couples, ordered drinks.Bartender was nice and drinks were great. Loved the vintage glassware.Appetizers of shrimp,pork and eggs were right on. We ordered rabbit, pork cheeks and the duck. My son is a chef in Kansas City. He would of loved this venue.Everything was right on. Texture,taste and presentation all wonderful.We live in Washington. We plan on returning as often as we can.